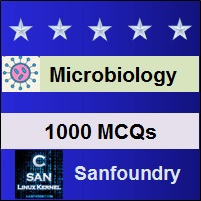 This set of Microbiology Multiple Choice Questions & Answers (MCQs) focuses on “Bacteriological Media”. 1. Which of the following is a characteristic of beef extract? Explanation: Beef extract, a complex raw material used as ingredient for preparing bacteriological media is an aqueous extract of lean beef tissue concentrated to a paste. 2. Which of the following is used as a solidifying agent for media? Explanation: Agar is used as a solidification agent for media and is not considered a source of nutrient to the bacteria. Agar dissolved in aqueous solutions, gels when the temperature is reduced below 45 degree Celsius. 3. Which of the following is a rich source of B vitamins? Explanation: Yeast extract which is an aqueous extract of yeast cells is a very rich source of the B vitamins and it also contains apart from it organic nitrogen and carbon compounds. 4. The isolation of gonorrhea-causing organism, Neisseria gonorrhoeae by the use of certain antibiotics in media is an example of which of the following? Explanation: The isolation of gonorrhea-causing organism,Neisseria gonorrhoeae, from a clinical specimen is facilitated by the use of media containing certain antibiotics; these antibiotics do not affect N.gonorrhoeae but do inhibit the growth of contaminating bacteria. This is an example of selective media as it allows the growth of only a particular microorganism. 5. Nutrient broth, a liquid media contains beef extract and peptone respectively in how much amounts? Explanation: Nutrient broth which is the most widely used media in general bacteriological work, contains 0.3 percent beef extract and 0.5 percent peptone.It may also contain if required 0.8 percent NaCl to maintain the salt concentration. 6. Which of the following instrument is used for sterilizing the media after it has been prepared? Explanation: Autoclave is a type of pressure cooker which has steam at 121.5 degree Celsius and under 15 psi pressure. This steam kills all the microbes present in the media and sterilizes it. 7. Colony formation can be observed in liquid media broth. Explanation: If microbial growth is found in liquid media, then the media shows turbidity but no colony formation can be observed. But in solid media microbial growth can be observed by colony formation as the media is already turbid due to the presence of agar powder. 8. Which of the following is a Complex media for fungal growth? Explanation: Complex media is a chemically undefined media where the exact composition is not known. For fungal growth, complex media used is Potato Dextrose Agar(PDA) media. 9. Which of the following are functions of Maintenance Media? Explanation: Satisfactory maintenance of the viability and physiological characteristics of culture over time may require a medium different from that which is optimum for growth.Prolific, rapid growth may also be associated with rapid death of the cells at the end of the growth phase. Thus, a maintenance medium is required then. 10. Which of the following bacteria requires nicotinic acid as a growth factor in their media? Explanation: Proteus vulgaris require nicotinic acid as a growth factor in their media along with glucose as a carbon source and also Ammonium Chloride.